James Cameron recently chatted to Fox News at the Covenant House Gala in Los Angeles where the director was being honored for his philanthropic work in helping homeless youth. Cameron discussed his ideas for shooting Avatar 2 & 3 back-to-back. Hit the jump for the details. "We're shooting two films back-to-back, so I'm writing two scripts, not one, which will complete a [three]-film story arc – not really a trilogy, but just an overall character arc so I'm pretty excited about that," he said. "We're doing a lot of preliminary work right now on new software and new animation techniques and so on. We're creating a new facility in Manhattan Beach so everybody that's not already dead is coming back." And is he feeling the pressure now that Avatar is the highest-grossing film of all time with $2.78 billion worldwide? "There's always an expectation. I had to deal with that after 'The Terminator' back in 1984. All of a sudden I had a big hit movie and it was 'what are you doing next?' But my job is take the audience on a journey and entertain them," he added. "The second I am sitting down writing, I just go to Pandora. I don't think about that stuff, about standing on a red carpet. It has its own life, really. The characters have their own lives." Avatar 2 will arrive December 2014 and Avatar 3 in December of 2015. 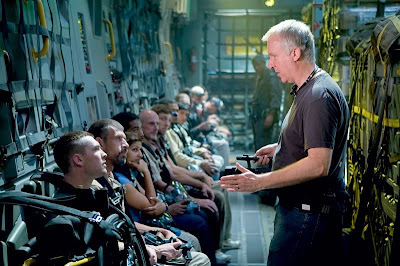 I'm reading: JAMES CAMERON Talks Shooting 'AVATAR SEQUELS' Back to BackTweet this!